The ninth edition of the OM INTERNATIONAL MATCH RACE gr. 2 is over. Twelve crews started the departure procedures on Friday, finishing the Round Robin on Saturday morning and then continuing with the King of the Castle for all the crews from 12th to 5th, while the Slovenian Dejan Presen, the Estonian Mati Sepp, Italian Ettore Botticini and Australian Will Boulden sailed the semi-finals. With a score of 3-1 Dejan Presen passed to the finals as the first and they met Mati Sepp, winner of the other semi-final. In the Petite final the italians helmed by Ettore Botticini beat with the score 2-1 Will Boulden. The Grand Final was sailed by Dejan Presen against Mati Sepp, with a score of 3 to 1 the Estonian Sepp won the ninth edition of the OM INTERNATIONAL LEDRO MATCH RACE. 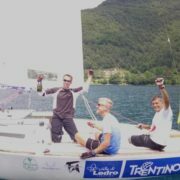 The level of this regatta was very high, with twelve teams coming from twelve different nations, four of which will stop in Val di Ledro for the YOUTH MATCH RACING WORLD CHAMPIONSHIP that will start on Tuesday.